Considered one of the best drum compressors ever, the original dbx 160 stands tall among its peers, boasting a very clean sound with minimum THD. The fast-acting dbx 160 compressor was used in almost every major recording in the late ‘70s and throughout the ‘80s, and later models in the 160 series also became industry standards. Created in collaboration with dbx, the Waves dbx 160 compressor / limiter plugin is an authentic-sounding software version of this storied piece of hardware. 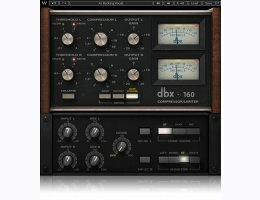 In addition to its meticulous modeling of the vintage compressor, the Waves dbx 160 plugin incorporates unique and exclusive features not found in the original hardware, such as Waves’ MS Matrix, mix and noise controls, and a stereo component. The result is a must-have compressor / limiter for use in the studio, live, or both. “To get closer to the realism of live performance” has been a goal of dbx since the company’s inception in the 1970s. This goal has come full circle with the Waves dbx 160 compressor / limiter plugin, which enables you to achieve stunning realism in the studio or to add nuance to an actual live performance.